1. Monastery Visit. Get to know members of the community and our way of life over a period of months. Understand the rewards and challenges. Discern with the Vocation Director if God is calling you to the monastery and if Trappist life is a good fit for you personally. 3. Postulancy. If it is discerned that God is calling you to continue this path, you may become a Postulant and be further initiated into the disciplines of our Order over the course of about six to twelve months. 4. Novitiate. 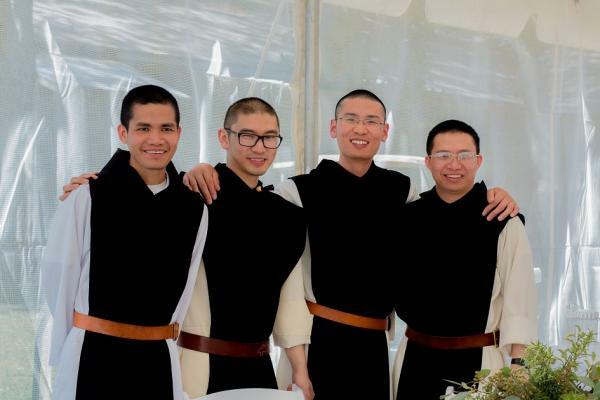 With sufficient desire and capacity to live as a Trappist, you may officially become a member of the Order as a Novice, clothed with the religious habit, and receive formal instruction on monastic observances with support from brothers over the course of two years. 5 Junior Professed. After two years of Novitiate, if it is clear that you truly seek God with zeal and obedience and are well suited to Trappist life, you may profess vows as a Junior Professed. These are "temporary" vows in which you commit to monastic life for a period of three years or three periods of one year. You are entrusted with greater responsibilities, become more deeply integrated in community life and continue your studies and formation. You also retain personal ownership of any of your goods until final vows are professed. 6. Profession of Solemn Vows. After prayerful and reflective period of temporary profession, having gained a deep understanding of the significance of the action you are about to take, you may freely petition the abbot to make solemn profession of vows. With permission, you may give yourself to Christ in the spirit of faith and commit yourself perpetually to live, with the love and support of the whole community, a life in accord with the Rule of Saint Benedict. Contact the Vocation Director to learn more about the Trappist-Cistercian and pursue your vocation. What is it really like to be a Cistercian monk? What is the process of becoming a monk? Arranging a "Come & See" visit. The best way to learn about anything is to have a personal experience; we encourage young Catholic men to visit us and experience our way of life firsthand. As Jesus invited His first disciples, "Come and See!" Usually a first visit is 4-5 days, although a weekend visit or other arrangement can be made according to your schedule. We welcome you to contact the Vocation Director to spend a few days with us and experience our life! Thank you, we want to hear from you! 4. Free of: debts, long term family obligations, addictive habits, regularly prescribed drugs. 5. Good physical and emotional health. Health reports (including HIV testing), college transcripts and baptismal/confirmation certificates are required for entrance. What is the Trappist-Cistercian Contemplative Life? Cistercian monks dedicate themselves to a life-long journey of worshipping God in a hidden life within the monastery under the Rule of Saint Benedict and an abbot. It is cenobitic, where everything is in common, a school of brotherly love seeking God, following Christ, and concerned with those God loves. Cistercians are called to render to the divine majesty a service that is at once humble and noble through the way of communal solitude and silence, liturgical prayer, lectio divina, and manual labor. The purpose of the monastery is to bring the monks into close union with Christ, since it is only through the experience of personal love for the Lord Jesus that the specific gifts of the Cistercian contemplative vocation can flower.